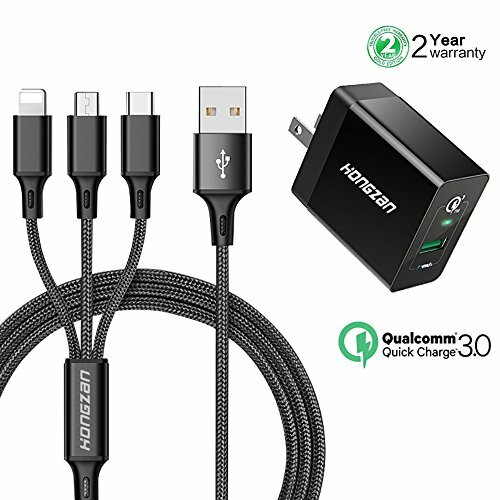 HONGZAN Fold the travel charger and 3 in 1 multi charging cable have 3 different charging connectors, that means 1 cable can meet your daily devices charging needs when you are going a long trip , in the office ,in the car or at home, which makes your life more convenient, smart, and colorful, you deserve to own one. [Lightning port ] for iPhone X/8/8 plus/7/7 plus 6s/6s plus/6/6 plus/se/5s/5c/5,iPad4, iPad Air, iPad mini,iPad pro and more. [Micro USB port ] for most Android phones,tablets,Bluetooth headset,external batteries,PS4/Xbox one controllers and more. [USB Type-C port ] for SamsungS9/S9+/ S8/S8+/Note 8,Nexus 5X/6P,LG G5 G6 V20,Lumia 950,Lumia 950 XL,Huawei P9/P9 Plus,OnePlus 2/3,Nokia N1,HTC 10 and more(not compatible with Macbook). Gives the fastest possible charge to any compatible phone or tablet, charging a phone up to 80% in 35 minutes-up to 4x faster than standard chargers. The cables only have charge function, can't transfer data. 1pack (4ft) Premium multi usb cable+1pack(QC3.0) fast charger adapter. 30 days money-back & 24-month warranty. Any questions you have, please don't hesitate to contact us. We will get you back within 24hours. 【What You Get】： 1 x QUICK CHARGER 3.0 18W POWER ADAPTER , 1 x 3-in1 charging cable(4ft) , 2-year warranty, and friendly customer service. 【Certified Quick Charger 3.0】：This wall charger designs with a super fast Quick Charge port, Passed FC/CE/RoHS certification, Compatible with all QC 3.0, backwards to Quick Charge 2.0/1.0 versions, Also charges non-Quick Charge devices at up to 2.4A up to 4 times faster than conventional charging. 【Fast Charger Adapter Cable KIT】：(3.8-6.5V)/3A; (6.5-9V)/2A; (9-12V)/1.5A output 18W, international voltage compatibility (AC 100-240 V),using Qualcomm Quick Charge 3.0 Technology and 4ft(48in) 3-in-1 Multi Charger Cable, ensures the fastest charging efficiency up to, make it the ideal for travel. 【MULTIPLE CIRCUIT PROTECTION】: Safety First, Premium components facilitated by surge protection, short circuit and over temperature protection safeguard your devices. If you have any questions about this product by HONGZAN, contact us by completing and submitting the form below. If you are looking for a specif part number, please include it with your message.